"We owe you for what you've done for us," Biden said, alluding to the ongoing scandal. He was addressing a group of some 200 cyclists, including injured veterans, set to ride 325 miles from Washington to Virginia Beach, in the annual Road 2 Recovery Memorial Challenge. "The government has a lot of obligations," the vice president continued. "The only truly sacred obligation we have before every other obligation that exists in this country is to equip those of you that we send into harm’s way and care for you when you come home and your families." "That is our sacred obligation, and we're behind right now. The VA is having problems, and we've got to get to the bottom of it,' he added. 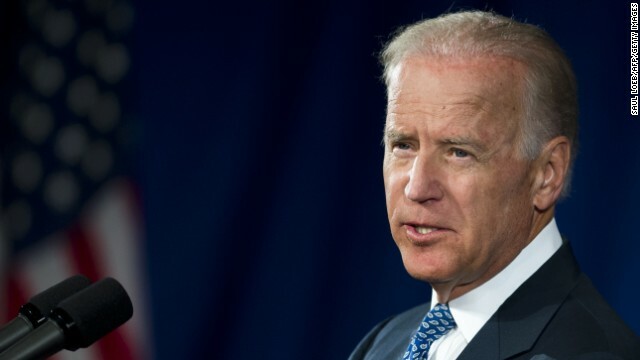 Biden noted the government has expanded the eligibility for the VA over the past few decades, but he said "that is not a reason for misrepresentation along the line." Last week, the VA's Office of Inspector General said it was investigating 26 agency facilities over allegations of doctored waiting times. A handful of lawmakers on both sides of the aisle have called on Shinseki to resign over the issue, but the White House has not called for the embattled secretary to step aside. Donald say's Apes could provide cost saving health care foe Veterans if trained properly. He also asked why men with no legs are complain about standing . When Men were Men and had funny nic names . The issue is who takes responsibility of the situation.....the Vets who have encountering problems without reporting until this crisis stage, the Sec. who should not have known the situation without information, the media that shrill over any little development against the POTUS, even when they should face neglience for lagged information procurement, OR Mr.President who the GOPers now expect to perform the role of a "Seer" of every problem, icluding foreign problems, and who ironically has been at the forefront of alleviating the Vets' problems. There is also the GOPERS who really increased not only the Vet population with their unfunded wars, but also their sufferings with unreasonable budgetary cuts. The call is US voters' and the time is this midterm election. This administration couldn't fix a problem if the solution was handed to them. Their mantra is to blame the previous administration, stall as long as possible to avoid any criminal prosecution in their administration and the pass the problem to the next administration. As the old saying goes, "you get what you voted for"..... and most likely we will do it again if we vote in another Democrat. Medical is covered but if you had no dental work done while you where in the service all they cover is pulling teeth. That should not be the standard practice – but let the US save a BUCK that way eh ? You were in the Senate for some time and you are just now speaking about the issue? All your Liberal buddies voted and passed things like Medicare, Medicaid, and now Obama Care but forgot the military/Veterans? Go away! One of the problems is your boss he knew about this back in 2008 said he would fix it just not in his term I guess.